Alterian’s 8th annual survey of marketers examined the changes affecting marketing professionals today. The results below show a developing shift—one that’s moving away from the typical broadcasting we’ve seen in social media’s early days and moving more toward higher engagement. In the near future, we’ll begin to see this single Insane Inflatable 5k channel engagement morph into a more synergistic engagement effort over multiple channels. As we’ve seen with other social media trends, these shifts take time. IT vs. Marketing: 66% of respondents admitted to having friction between their IT and marketing departments. Social Conversations: A vast majority of marketers (7 out of 10) say they have little understanding of social media conversations surrounding their brand. In addition to delivering these insightful statistics, Alterian also created the above infographic to give a snapshot of the most important stats. Click here to read the full report and download the infographic. Alterian asked marketing professionals a series of engagement questions. Let’s take a look and see where you stand in relation to others in your industry. #1: How will marketing budgets change over next year? About half of the marketers surveyed claim their budget will increase slightly, while about 9% see their budgets greatly increasing. In addition, about a quarter of those surveyed plan to maintain the same investment, roughly 10% will decrease their budgets and a little over 7% say they have not yet determined next year’s budget. #2: How will social media budgets change over next year? About half of the marketers surveyed expect their social/digital marketing expenditures will increase slightly while 23% see their expenditures greatly increasing. Also, 14% of the marketers plan to maintain the same investment while 4% will spend less than the year before. #3: Do you monitor social media conversations? Almost 40% of those surveyed said they are using a few ad-hoc tools and 30% said they are reporting regularly to management. 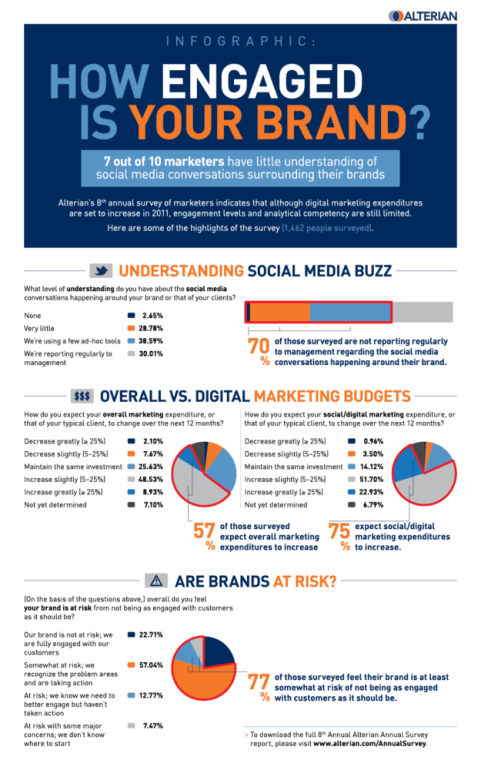 In addition, almost 30% claim they have very little understanding of the social media conversations happening around their brand or those of their clients. #4: Are you as engaged with customers as you should be? A little over half of those surveyed (57%) feel their brand (or client’s brand) is somewhat at risk and are taking action to fix the challenge. 13% said they know they need to better engage but haven’t taken action and 7% admitted there were major concerns, but didn’t know where to start to fix the issues. Lastly, about a quarter of the marketers claimed their brand (or those of their clients) was not at risk and they were fully engaged with their customers. Now it’s your turn! Did any of these statistics surprise you? What changes have you made to engage with your customers? Share your thoughts in the comments box below.